Represented by prof. Kalevi Ekman, Director of Design Factory: Elina Kähkönen, Teacher in Charge - Aaltonaut. Represented by Mick Fuzz, Co-organizer. Indymedia rural media centres & tech spaces at festivals - The rural focus of our BarnCamp events comes from the many Mobile media centres in rural convergence camps and that members put on. BarnCamp was founded a space to pass our our skills. http://v4c.org - International network with similar aims to BarnCamp but focused on Video for Change work. Bioinformatics Institute is the first non-governmental non-commercial bioinformatics educational and research institution in Russia. It has been created in 2013 on the basis of Bioinformatics Courses (since 2010) supported jointly by Russian Academic University of Russian Academy of Sciences and JetBrains company. The Institute's mission is to prepare new generation of highly qualified specialists in the field, popularize bioinformatics in Russia and contribute to Russia's transformation into world research center in bioinformatics. Educational programs are aimed to acquaint students with the main objectives and methods of bioinformatics and open problems related to this science. Represented by Eketarina Chaykina, curator. Represented by Anna Kholina, Curator of exhibition projects. Represented by Stephan Krusche, M.Sc, Project Leader. CRI, Center for Research and Interdisciplinarity, is a Parisian meeting place of international researchers and students passionate about interdisciplinary science and innovation in education. CRI is connected with the University Paris Descartes through innovative Bachelor, Master and PhD program in interdisciplinary life science, as well as newly emerging Master and PhD program in innovative educational methods. Generously funded by the Bettencourt Schuller Foundation, CRI is implementing learning through research methods and development of 21st century skills in all curricula with the aim to train the next generation of change-makers in science and education. This pioneering approach has recently been recognized by UNESCO, as well as French government which is investing in the formation of the Institute for Learning Through Research in the center of Paris. Represented by Tamara Milosevic, Curriculum Designer. The Center of Science and Technology Studies at the European University in St. Petersburg has recently launched an ambitious research project to identify, map and understand Russian Computer Scientist community at home and abroad. The multidisciplinary strategy of the center is aimed at presenting and analyzing history, current state of affairs, trajectories and ecologies of Russian computer science and IT worlds. Represented by Lubava Statokhina, Research Assistant; Liliia Zemnukhova, Research Assistant. Digital October Center is a place for globally-minded technology entrepreneurship community. The Center is built around two core themes: new technologies and technology entrepreneurship. It hosts unique educational programs inviting top educators and experts from around the world. Represented by Yulia Lesnikova, Director of Educational Programs. FabLab Amersfoort is an open workplace with digital equipment and where everybody can use these machines to create (almost) everything. It is part of the worldwide network of FabLabs. Represented by Diana Wildschut and Harmen Zijp, Founders. GameChangers is a free two-year program for ad-hoc education and research. Started in 2010 as an offline wiki course on IT industry GameChangers is constantly expending its thematic focus to various related and emerging industries with tracks in bioinformatics, legal issues in IT, education, design and usability, enterprise architecture, data mining and others. Represented by Sergey Dmitriev, Co-founder; Aliona Markovich, Development Lead; Roman Musatkin, Design Track Curator; Ekaterina Chaykina, Bioinformatics&Biotechnology Track Curator. Represented by Krists Avots, Head of Operations. The GREEN Program is the leading provider of renewable energy education, experiential learning and career development around the world. Focused on bridging the gap between theoretical textbook learning and accelerated career development. The GREEN Program allows students and young professionals to travel to the epicenters of clean energy, like Costa Rica and Iceland, to interact with technology and learn from industry experts. Represented by Mikhail Naumov, Melissa Lee, Founders. Represented by Sveinung Skaalnes,Partnership Director and alumni. ikasHUB is a co-learning laboratory aiming to develop personal skills and generate new ideas with value for the society. ikasHUB offers learning experiences that will allow to explore your whole potential. Represented by Ander Pomposo, Christina Sala, Founders. NB: This example is not presented in Lightning Talks. Represented by Maíra Rahme, Branding and Communications Lead and alumni; Lyra Skusa, Fundraising and Administration Lead and alumni. The Kaospilots is a hybrid business and design school, a multi-sided education in leadership and entrepreneurship designed to help students not only to fit the future, but to create it. Represented by Morten Nottelmann, Educational Designer & Consultant and alumni. KOULU (i.e. ‘School’) is a festival for peer-learning operating based on the acknowledgment that everyone has skills and knowledge that others want to learn. All the teachers are volunteers and all the lectures are concerning a good life. Representative to be confirmed. 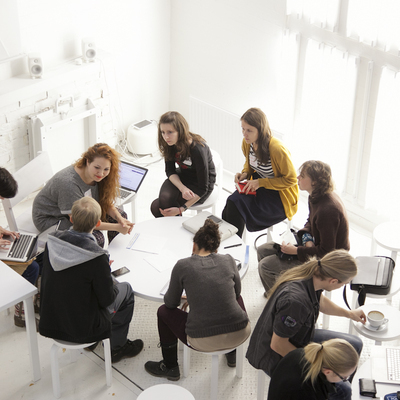 The Learning Environments Research Group (short name: LeGroup) at Aalto University is involved in research, design and development of New Media tools, as well as their use and application, in the field of learning. Represented by Prof. Teemu Leinonen, Research Group Leader. 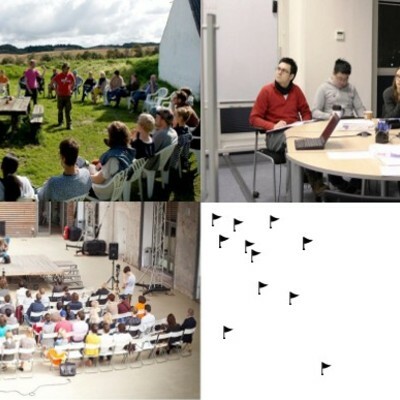 Open Urban Lab is an inter-disciplinary professional group working in the areas of urban research, urban planning, strategic development of the city. The team includes architects, urban planners, sociologists, psychologists, designers, transport planners, city brand managers, communication and IT professionals; with local, international, and regional experience. Represented by Sophia Chilingarova. Represented by Pauliina Jalonen, CEO. Represented by Maria Ritola, Club Leader. Represented by Fiona Geuss, Founding Member. Represented by Liya Safina, Learning Facilitator. THNK, the Amsterdam School of Creative Leadership, has a mission, to accelerate and develop the next generation of creative leaders that will have societal impact on the world. THNK brings together curious and forward-thinking executives, thought leaders, and organizations across the world, across diverse industries and fields, for a distinctive experiential learning experience in creative leadership. Represented by Tuija Pulkkinen, Founding Participant of THNK and alumni (first registered student of THNK); Emer Beamer, Curriculum Development Contributor and alumni, Founder of the Dutch School.